Sometimes people have more than one serious health complication. If those problems happen to be three or more of the most prevalent risk factors for heart disease and diabetes, such as high blood pressure, high triglycerides and a large waistline, they merge into a single disorder known as metabolic syndrome . Metabolic syndrome represents one very serious illness, affecting 40 percent of the U.S. population over age 40. “The pandemic of obesity, which begins in childhood, is deeply concerning. Adolescents today are more obese and less physically active than their parents and already have higher rates of type 2 diabetes. Here’s why registered dietician Cynthia Sass, with master’s degrees in both nutrition science and public health, calls avocados worthy of superfood status : They can effectively combat nearly every aspect of metabolic syndrome. According to Sass, the “impressive range of studies” the researchers perused also covered the nutritional impact the firm, velvety flesh of this pear-shaped green-black food, technically a fruit can make on several other areas of the body, not just metabolic syndrome symptoms. 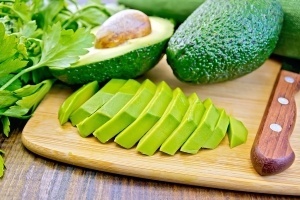 It’s possible that more than just the fruit itself may be good for you; researchers found possible benefits from consuming the leaves, peels, oil and even the large pit at the center of avocados (although Sass suggested that sticking to the peeled, pitted flesh would be best until further studies can be done). Combine avocados with salsa or fruit chutney to make guacamole; mash them with a bit of lemon juice, extra virgin olive oil, salt, and pepper for a quick vegetable or pita dip, or a delicious addition to egg salad. Serve mashed avocado on poached or lightly cooked over-easy eggs or slice, salt and eat them all by themselves. The beauty is that it’s not just about the versatility and flavor of avocados; the nutritional profile is incredible. If you don’t get any other concept about how avocados can literally change your health, this might move you: The high-fat content in avocados is a good thing — it’s not “bad” fat. In fact, it’s good, necessary fat from oleic acid, which is the same monosaturated fatty acid contained in olive oil. Further, neither avocados nor avocado oil are hydrogenated or loaded with trans fats or other unhealthy oxidized fats like most canola , safflower , corn or other vegetable oils you’re urged to cook with may be. Avocado oil can even be drizzled over salads and used in recipes calling for other oils. Avocado oil also has a relatively high smoke point compared to olive oil, making it a better choice for cooking,  although coconut oil  is best for that purpose. While some people remain concerned that eating high-fat foods like avocados may adversely affect their cholesterol levels, the opposite is actually true (plus, cholesterol  is not the evil it’s made out to be). The California Avocado Commission reports that avocados contain about 22.5 grams of fat, and two-thirds of that is monounsaturated. Other essential nutrients include fiber, vitamins, folic acid, vitamin E and more potassium  than you’d find in a banana. Research shows several other positive aspects about avocados: One of the most interesting is that people who eat more of them generally weigh less and have smaller waistlines than people who don’t, even if their overall caloric consumption is smaller. Avocados also were found to be more filling than other foods. In one study, participants were divided and each half were given a meal to eat, one of which contained avocados. “Eight preliminary avocado cardiovascular health clinical studies (have) consistently demonstrated positive heart healthy effects on blood lipids profiles. This is primarily because of avocado’s … monounsaturated fatty acids and high-unsaturated fatty acids (MUFA and PUFA) content, but its natural phytosterols and dietary fiber may play potential secondary … roles. In other words, when you eat carotenoid-rich foods along with healthy fat avocados, your body becomes better able to absorb more of their fat-soluble nutrients, such as alpha- and beta-carotenes, as well as lutein, zeaxanthin and other antioxidants. Here’s another benefit that’s very important: Avocados carry a very light load of chemical pesticide spray residue in comparison with other plant-based foods, so it’s not necessary to try to find (or grow) organic varieties. They are a fruit, but unlike so many others, avocados don’t contain high levels of fructose. Instead, the healthy fat they offer rivals that of coconut oil, organic raw butter, and raw nuts such as pecans and almonds. Did you know that avocado oil is also good for your hair and skin? It makes your skin softer and more supple, and renders your hair smoother and less frizzy and tangled than without it, especially if your hair is dry. In fact, it has many of the same properties as coconut oil.